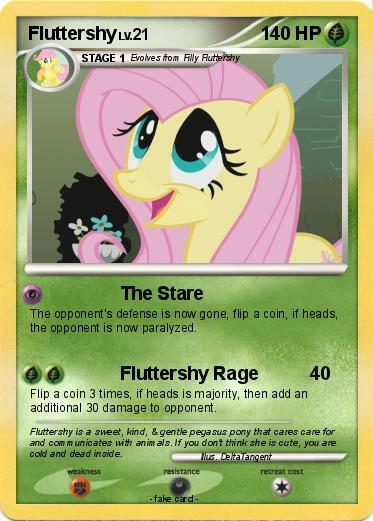 The opponent's defense is now gone, flip a coin, if heads, the opponent is now paralyzed. Flip a coin 3 times, if heads is majority, then add an additional 30 damage to opponent. Comments : Fluttershy is a sweet, kind, & gentle pegasus pony that cares care for and communicates with animals. If you don't think she is cute, you are cold and dead inside.